I recently returned from a trip to New York City that included an afternoon visit to the New York Metropolitan Museum of Art. The special exhibit, Jewelry – The Body Transformed, was of particular interest to me for two reasons. As a Graduate Gemologist and Jewelry Appraiser, the subject of this exhibit is my passion. But most importantly, it was particularly satisfying to me to view the exquisite “Sweet Pea” brooch. The “Sweet Pea” brooch was crafted by the hands of a father and sons’ team, Marcus & Sons, circa 1900, and is one of the most complicated forms of jewelry made, even in today’s standards. Founded by Herman Marcus, a German immigrant to the U.S. in 1850, he worked for the venerable Tiffany & Co., eventually striking out on his own. His sons joined him in creating some of the most ornate Art Nouveau and Revivalist jewelry of their period. The enamel work on this brooch is called “pliqué -a-jour”, a French term meaning open to light. The leaves and flowers are much like a miniature stained-glass window in an 18 karat yellow gold frame. This enameling technique is complicated on flat surfaces, so the three-dimensional form of this piece proves to be an extraordinary work of art. There are four articulated sections allowing the flowers and buds to flutter as the wearer moves. The buds that drop at the bottom consist of four conch pearls. Unlike the more common oyster pearl, conch pearls are produced by the rare Queen Conch mollusk. Only 1 in 10,000 mollusks hold a conch pearl. The leaves are adorned in platinum with diamonds set on a curve to create dimension and shimmer throughout. The “Sweet Pea” brooch came across my desk in 2015. The owner had inherited the brooch many years prior and had kept it in its original box in safe keeping. It was in excellent condition for a century-old piece. Many pliqué-a-jour pieces have cracked and broken enamel, but this one showed none. The owner wished to sell the brooch to augment his impending retirement. After a less-than-pleasant experience at a “we buy gold” store, where the owner was offered $2,500, he decided to look for a second opinion. A referral from a trusted friend led him to call me and we met. At first sight, I knew that this brooch was one-of-a-kind and of extraordinary design and quality. The trademark stamp “Marcus & Co.” indicated the maker. I immediately called a longtime friend and colleague on the east coast, Virginia Salem, and Director of the Fine Jewelry Department at Freemans Auction house. The owner of the brooch agreed to consign to the auction house, and the brooch made its way back east. Ms. Salem had seen other pieces by Marcus & Co. come across her desk, but this was one of the finest examples yet. With her knowledge and connections to dealers and collectors, she visited NYC to personally present the brooch to interested parties. Eventually, the hammer fell at $161,000, far above the pathetic offer of $2500. The owner was thrilled. But there is more to the story. 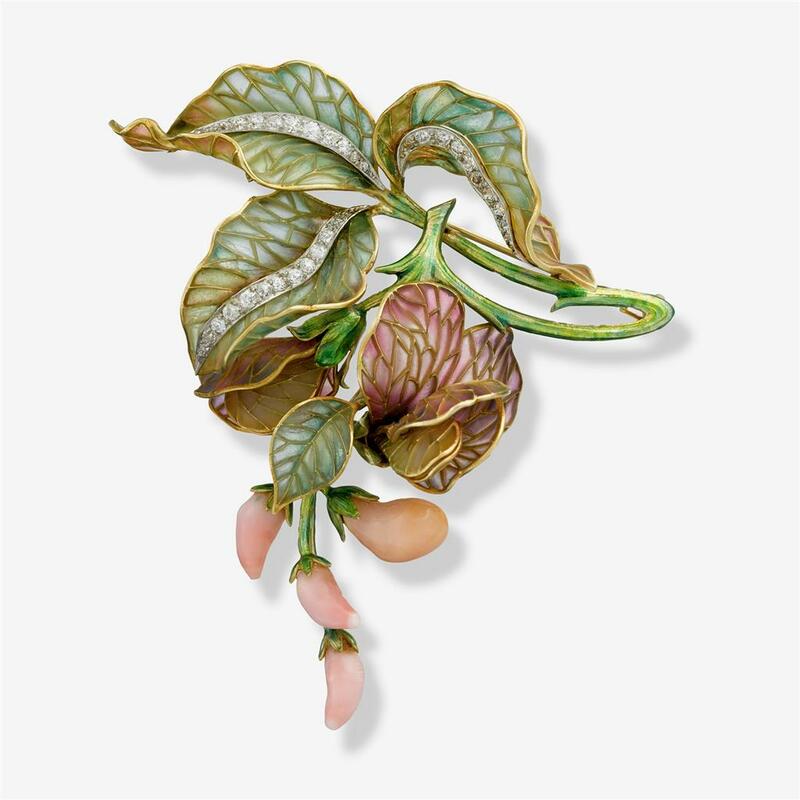 The winning bidder donated the “Sweet Pea” brooch to the New York Metropolitan Museum of Art. Now in its new home, thousands of visitors will be able to view an exquisite brooch they may well had never enjoyed the opportunity to see. Knowing I was able to facilitate in the journey of such important history in jewelry is deeply satisfying and is an experience that I will never be forget.